Enjoying the outdoors whatever the weather throws at us is good for kids' development and great for preserving Mom's sanity as well. As the saying has it, there's no such thing as bad weather, only bad clothing. If kids are comfortably dressed in weatherproof winter clothes they can enjoy splashing in puddles or making snow angels all winter long. Outerwear for kids can be quite expensive: however, the benefits of good-quality winter wear for kids are appreciated by their wearers. High-tech fabrics are soft, light and breathable and the most sensitive toddlers should not complain at wearing them. Factors to bear in mind when shopping for kids' cold weather gear are comfort, insulation and flexibility, allowing the freedom to walk, run and jump about whatever the weather. If your budget is feeling the pinch, try asking around among family and friends for hand-me-downs, as these items are usually outgrown before being worn out. Goodwill stores and second-hand sites are other excellent resources to explore. I also like visiting children specific consignment shops like Once Upon a Child. For winter weather outfits, layers are a good choice. 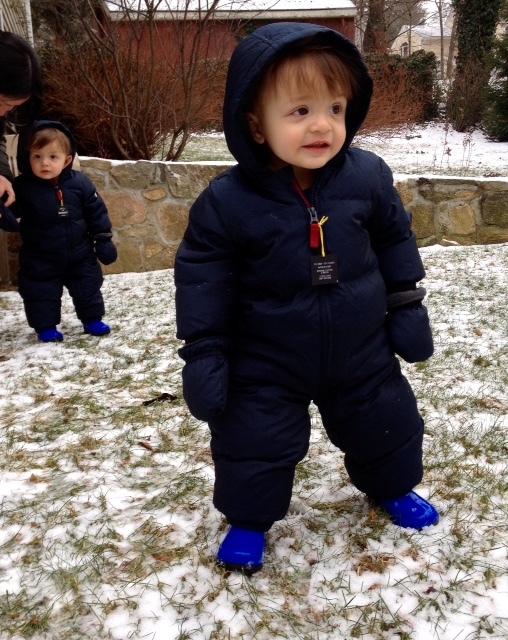 A padded waterproof jacket or snowsuit overalls worn over pants are flexible and easier to get on and take off than an all-in-one snowsuit - an important consideration if your child is learning to get dressed. Make sure to get your kids outdoorweather garments that fit well. Little kids find running around in snow pants or walking clothes that are slightly too long and bulky a frustrating business! If you prefer an all-in-one for your toddler, look for a zip that runs right down to the ankle like in the photo above of my boys to allow for easy toilet trips or diaper changes. Cuffs at wrist and ankle should be adjustable with velcro tabs or fully elasticated, to keep out chilly breezes. Underneath, cotton layers are kind to the most sensitive skin. Synthetic blends that wick moisture away from the skin are also very comfortable. In the coldest weather, a soft woolen knit adds an extra layer of warmth. Long thermal underwear or tights worn under pants will keep little legs cozy. Thick socks are comforting, but make sure that boots are big enough to fit easily over the top. Socks made from a mix of angora and wool feel especially soft, and can be worn over cotton socks for extra warmth. Kids need two pairs of boots to see them through the winter weather, fleece-lined snow boots and waterproof boots for rainy days. Mittens are both warmer than gloves and easier for little ones to put on and take off. If your kids tend to lose their mitts, try fastening them to a string that can be threaded through the sleeves of their jacket. Mittens made from water-resistant fabric are an excellent choice for both snowy and wet weather. To top it all off, a hat is essential to keep little heads warm in cold weather. The best hats have ear-flaps, and are made from fleece or wool. Hats should fasten with Velcro tabs under the chin as tie fastenings can pose a risk to young kids. Also, come Spring don't forget to take advantage of winter coats and accessory sales and stock up for next season! I love the little boy's jacket. Adorable! That is definitely one of to-buy items for Winter.